Everyone in Richmond and its surrounding counties have been dealing with a particularly windy week- including the Arborscapes Team! Its weeks like these that remind us of the dangers and inconveniences that come with weak tree structures and dead or declining trees and tree limbs. In this photo you can see the wound left on the tree, as well as the large branch on the ground below. When a poorly structured tree loses a limb in nature, it becomes a new addition to the ecosystem. When one of your trees loses a limb, this can mean potential damage to your valuable property. Ideally, we prefer to prevent these kinds of incidents through providing services like pruning to promote healthy structure, or cabling and bracing trees with structures susceptible to failure. Luckily this tree wasn’t closer to our client’s home. As you can see, it is a fairly large limb, capable of doing considerable damage. This week we got to see first-hand why some trees could benefit from cabling and bracing services. Our crew responded to a call in Midlothian, where our client had a tree that was damaged by high winds. In this case, the tree’s natural structure caused undue stress that resulted in a large branch splitting out of the tree. Although it’s difficult to determine with absolute certainty, we believe this problem could have been remedied by Arborscapes installing a combination of a cable and a brace rod system. 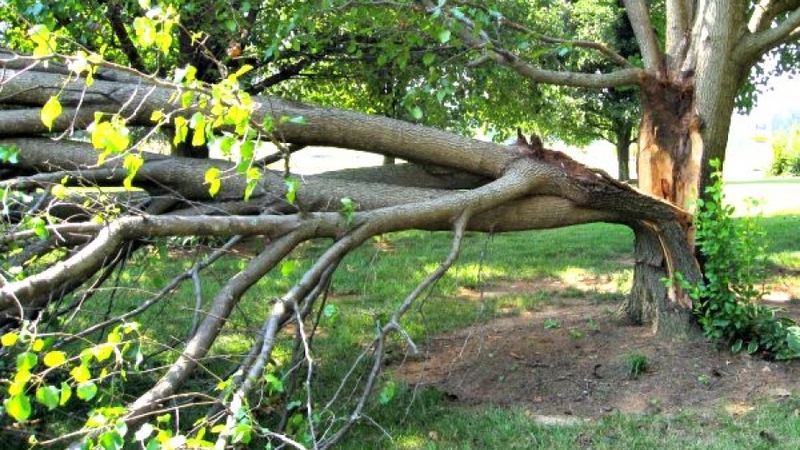 Unfortunately, it’s not always clear to an untrained eye when a tree has a weak structure or dead limbs, so a large fallen limb can often come as a big surprise to property owners. If you are unable to clearly identify if there is something wrong with one of your trees, its best to have a Certified Arborist perform an evaluation of the tree’s health and structure.